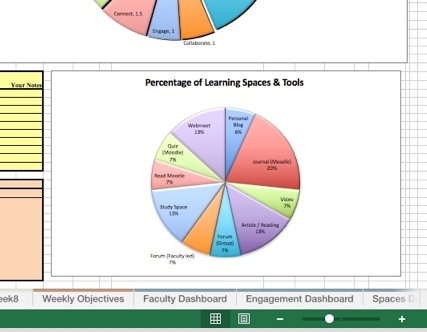 Version 3.5.1 makes a minor correction to formula so that the pie chart representations of learning spaces (or technologies) draw on an embedded table. This means that any modification of the validated data range (Overview) requires a regeneration of the weekly/topic embedded table (in the grey band across the bottom of each sheet). This ensures that by selecting from the filtered table (Weekly/Topic) all instances greater than zero results in a pie chart which only displays spaces or technologies in use.